Copic markers are known for their vibrant colours and blending ability. Come learn the basics about the markers themselves and how to make them work for colouring. It's a great class for those who want to perfect their techniques, too, and get some extra tips and tricks. Please bring your own Copic (or other brand of) alcohol markers. There is one class set of markers that can be shared if needed. 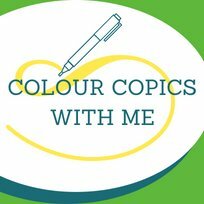 Requirements: Please bring your own Copic (or other brand of) alcohol markers. There is one class set of markers that can be shared if needed.